Cherries and almond are a fantastic combo. These look fabulous! I love that you fold in chopped cherries in the batter and use the juice in the frosting mix. For some reason I always associate maraschino cherries with bourbon… I wonder if the frosting will mind terribly if I substituted 1 tbsp cherry juice with bourbon? :) Should be enough to impart flavor? And a good match for the almond extract? These look absolutely delectable. I can’t get enough of the combination of cherry and almonds in desserts, it’s just the best. These are so pretty! Quite the show stoppers if you ask me! 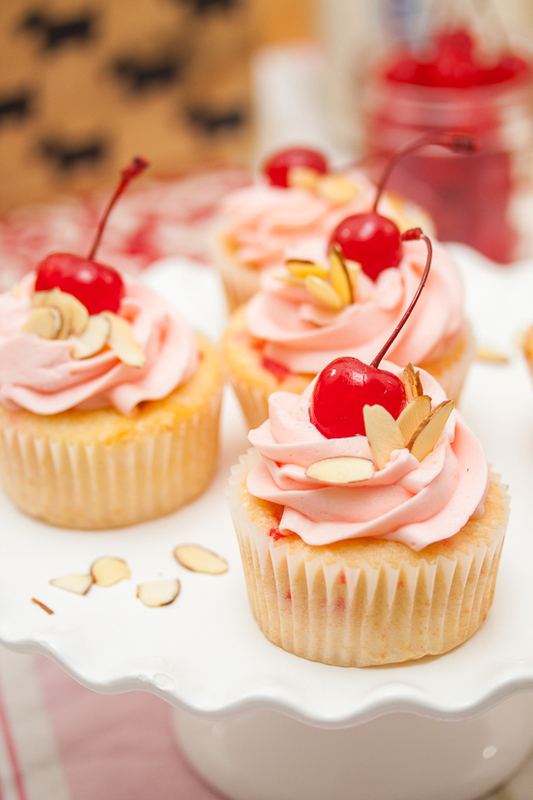 I don’t think I’ve ever had a cherry nut cake before, but I love that you turned your grandfathers favorite cake into cupcakes!! These are so cute! And I’m willing to bet they taste even better than they look! I’ll take 12. 😉 Cheers! I lost my Dad way too early also! I always made cupcakes for him, so your post was really lovely and brought back some great memories! Thanks for sharing! I bet your Grendad would have LOVED these.. they certainly sound delicious! I lost my mom before she was able to meet some of her grandchildren – I hope I can keep her memory alive for them like that! These are beautiful Laura!! Love the colors and the flavors. They’d be perfect for the Easter dessert table!